There were two distinct phases to the design of Mosaic. From its introduction in 1994 to 1999 there were distinct mosaic tiles, with heavy use of gold leaf, and clear glass trails making thick ribbons around the body. 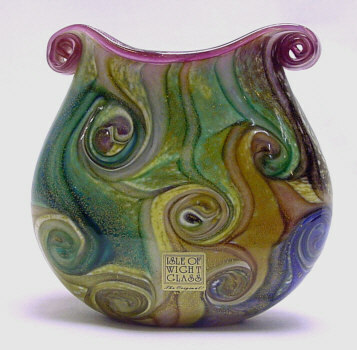 From 2000 to Mosaic's withdrawal in 2011 brighter colours were used and the colour trails were pulled into spirals. The collection was called Golden Mosaic from 1994-2003, when only gold leaf was applied to the body. In 2003, when a silver colourway was added, the collection was renamed simply Mosaic. There were applied rims or stoppers in blue, green or pink. 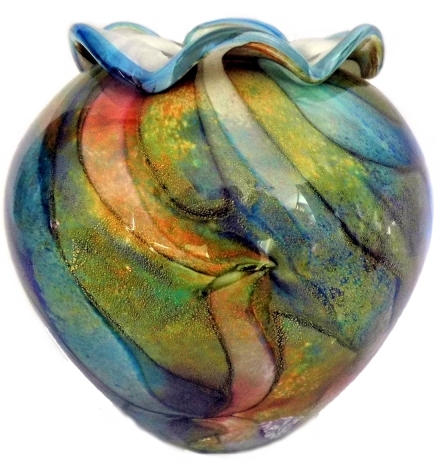 This vase was made in the first year of production. 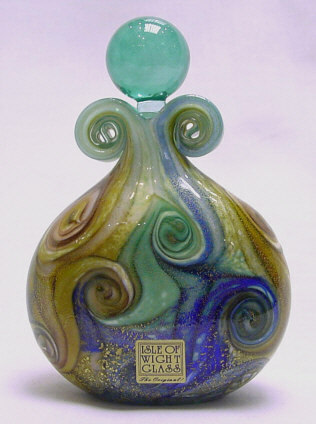 It is signed to the base 'Timothy Harris, IOW Glass England, 1994'. It measures 9.5 cm wide and 7 cm high. 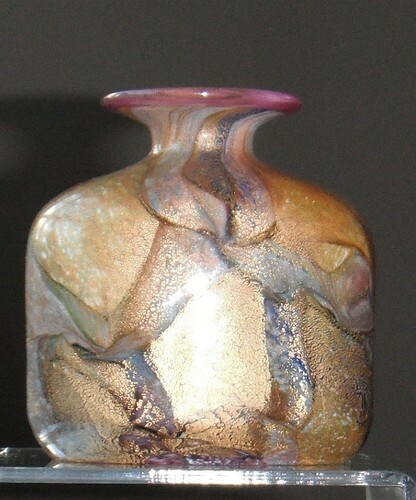 This bottle-shaped vase is 7.5 cm wide and 7 cm high. Image courtesy of Rosemary Anderson. 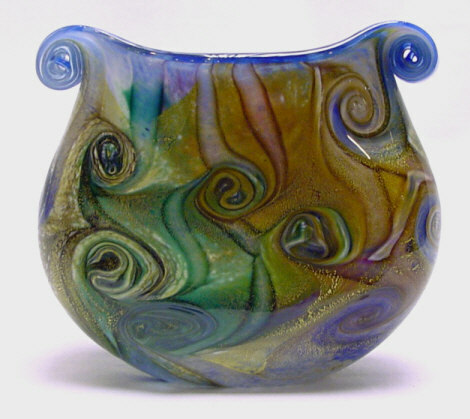 An unusual baluster vase with a wavy rim, 14 cm high, 13 cm maximum width. The black on gold square label indicates an early date, probably 1994. 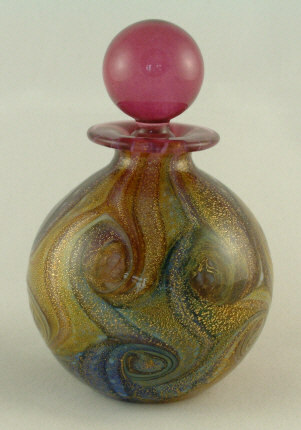 Mosaic Gold round perfume bottle with a pink stopper, 6.5 cm diameter. The Gold colourway was also available with a blue or green stopper. Mosaic Gold miniature bag vase with a green rim, 5 cm high. Also available with a pink or purple rim. Image courtesy of Seven Crowns. 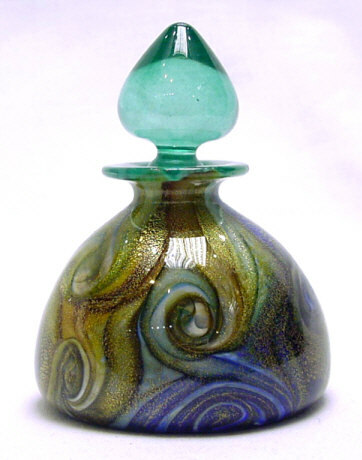 Mosaic Gold flask perfume bottle, 11 cm high, with a green stopper. Also available with a blue or pink stopper. Image courtesy of Seven Crowns. 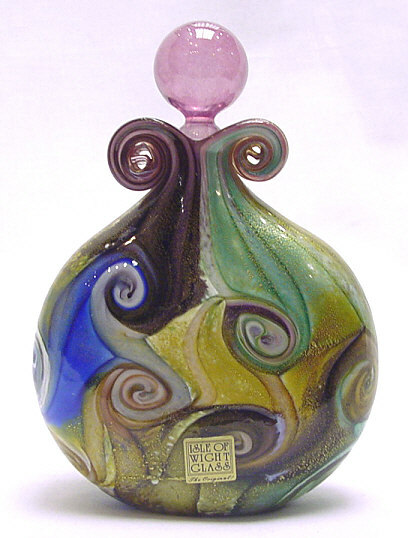 Mosaic Gold flask perfume bottle, 13.5 cm high, with a pink stopper. Also available with a blue or green stopper. Image courtesy of Seven Crowns. Mosaic Gold small bag vase, 10 cm high, with a pink rim. Also available with a blue or green rim. Image courtesy of Seven Crowns. 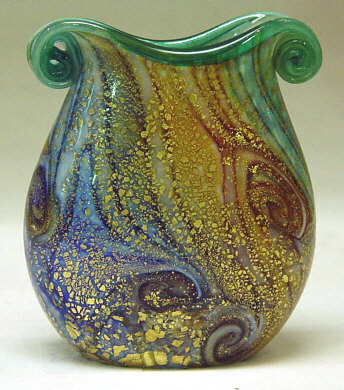 Mosaic Gold medium bag vase, 12 cm high, with a blue rim. Also available with a pink or green rim. Image courtesy of Seven Crowns. 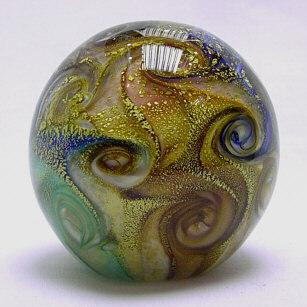 Mosaic Gold round paperweight. 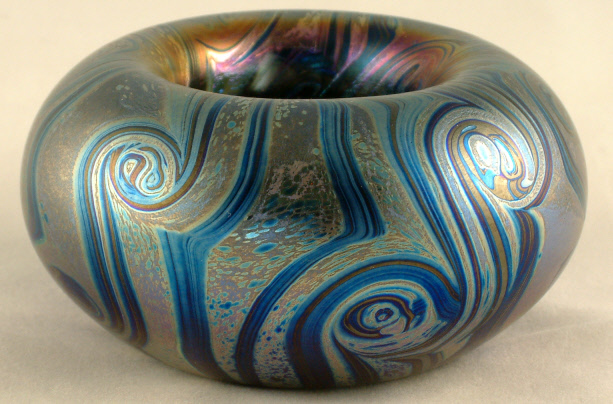 They were available 6.5 or 7.5 cm diameter. Image courtesy of Seven Crowns. Mosaic Gold small conical perfume bottle, 6.5 cm diameter. Also available 8.5 cm diameter. The stoppers were in blue, green or pink. Image courtesy of Seven Crowns. Mosaic Silver tealight holder, 5 cm high, 8.75 cm diameter.